It’s also important for dog owners to be observant of changes in their dog’s body or behavior. The initial symptoms of the virus include runny nose, fever, and a persistent cough. At The Retreat, we have always required the Canine Influenza vaccine for our boarding, grooming, and play care guests in attempt to protect our patients and guests from the virus. The current Canine Influenza vaccine being used at animal hospitals nation wide protects against the H3N8 strain of influenza. In regards to the Chicago outbreak, scientists have determined that this is a different strain known as H3N2. With that being said, Dr. Billy and Dr. Jimmy still advise ALL pets, especially those in boarding/grooming/doggie day care environments, be vaccinated with the current Canine Influenza vaccine in order to offer some sort of protection from the virus. 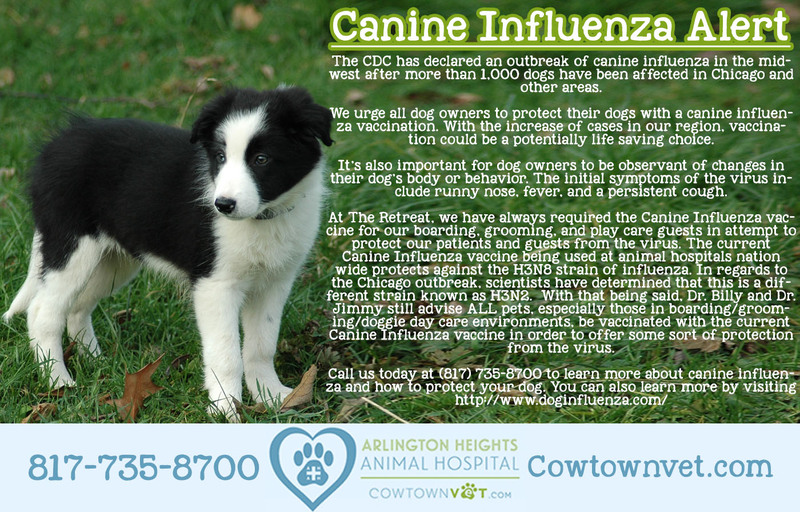 Call us today at (817) 735-8700 to learn more about canine influenza and how to protect your dog. You can also learn more by visiting http://www.doginfluenza.com.